My newest and most popular hat! Personalized with your 3 letter monogram! This is a NEW ITEM in my shop! Very soft and floppy and crushable! I just love this hat! This hat has a handmade ribbon & bow in black and leopard. Special order items may include polka dots, animal ribbon, etc. which are sewn on the base ribbon. The base ribbon is 3" grosgrain - commercial grade. Base Ribbon colors currently in stock are black, navy, white or hot pink. I have other colors, but some may be a special order, therefore, please send a convo if requesting any other color ribbons than black, white, navy or hot pink. These items are usually available, however, may take a few more days to ship to you! This hat includes a 3 letter monogram, a handmade two tone bow and a flat or ruffled hat band! Monogram may be placed on front, side or back of hat, too! This sale is for the natural hat with black stripe but I also have other solid hat colors! Please & check my etsy shop for details. 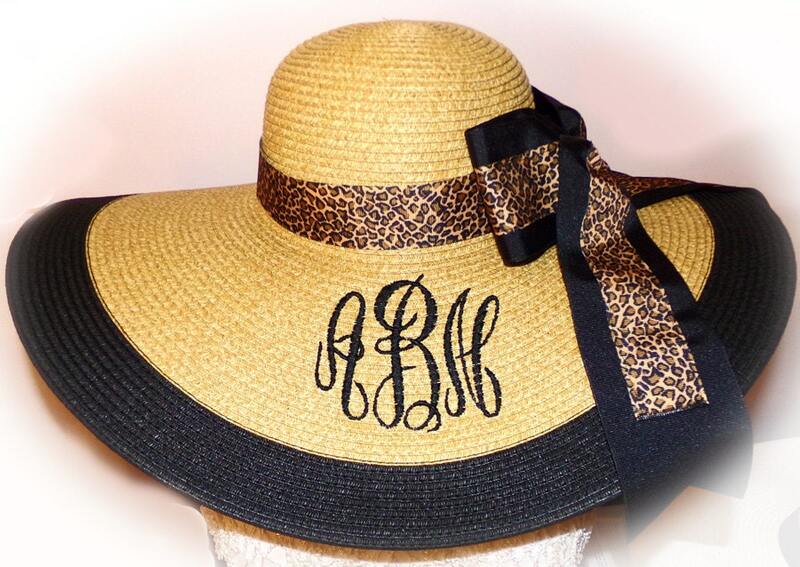 Each monogram is custom designed with coordinating hat band and two tone bow. Hat Band, Bow and Flower are Removable.